Dr. Iyer is a firm believer in the therapeutic value of establishing a trusting and respectful relationship with her patient. With a holistic, non-judgmental and gentle approach, she focuses her efforts on getting to understand the patient prior to formulating a treatment plan. Her approach is collaborative and thorough, exploring a patient’s biological, psychological and social factors before determining the next best step, which may or may not include medications. She treats all adult mental health illnesses with a special interest in women’s mental health, including those patients in the peripartum and post-partum stages. 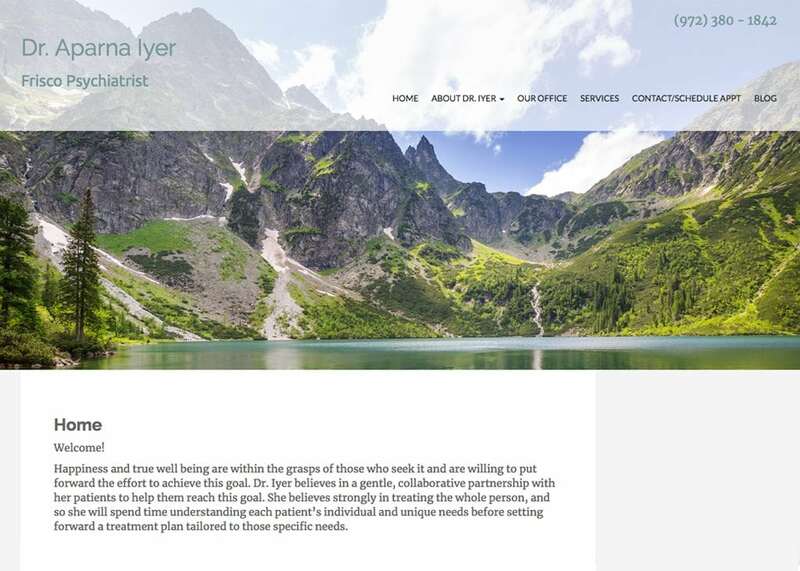 Dr Iyer visualized a clean and informative psychiatric website. The color scheme includes light colors to provide an inviting and calming atmosphere. The site has plenty of spacing for patients to easily view content on the site. The slideshow is featured on the home page with welcoming images.